It’s been quite some time since I last submitted a blog here on the mighty My 1-2-3 Cents website. I think the last time I wrote something fans still liked Roman Reigns. Let's see if I can remember how to be snarky and cynical. Speaking of cynical, be sure to listen to my podcast Positive Cynicism. Available on the Jittery Monkey Podcasting Network and on iTunes. Back to the blog. On Friday (10/20/2017) WWE announced that due to health reasons Bray Wyatt and Roman Reigns were pulled from the TLC network special. WWE also announced AJ Styles would replace Bray in a match against “The Demon” Finn Balor while Kurt Angle would wrestle his first match in WWE in over ten years filling in for Roman Reigns in the Shield vs. The StrauKane Bar-Mizvah 5-3 TLC match. On paper these changes garner excitement. In reality, they show WWE’s lack of coherent storytelling and lazy booking of creating specific highlight clips rather than organic moments. I guess I should explain why I’m being critical of these changes. WWE is not an independent promotion doing a spot show every month focusing more on putting on good matches than ongoing storylines. WWE has weekly episodic television. Whatever happens Sunday should play off of what has happened over the previous weeks and lead into what’s going to happen the next night on Monday Night Raw. So yes, putting AJ Styles and Kurt Angle into matches makes sense if Sunday’s show was a house show and WWE wanted to give fans suitable replacements to get their money’s worth. As a televised event, the changes make little to no sense. Die-hard wrestling fans know AJ Styles and Prince Devitt (Finn Balor’s pre-WWE name) were members of the super popular (and IMO, super douchey) New Japan faction The Bullet Club. Seeing two former Club members wrestle each other has been a dream match since AJ Styles debuted in WWE at Royal Rumble 2016. For non-New Japan fans or fans who don’t know the history of AJ and Finn, what interest is there in seeing the two wrestle? I’m not taking anything from the talent of the two wrestlers as this match could have the potential to be the match of the night. Looking at the matchup from a logical (and longtime readers know Kevin and I often complain about the lack of logic in wrestling) standpoint, I fail to see a storyline reason for this match. TLC is a RAW brand show. AJ Styles is a Smackdown superstar. So far in the 18-month redo of the brand split, WWE has done a pretty decent job of keeping the brands separate on non-co-branded shows. Why has Smackdown General Manager Daniel Bryan allowed to let AJ Styles wrestle for RAW? What storyline reason does AJ have to wrestle Finn? WWE is still promoting Finn’s alter ego, “The Demon” for this match. Why would “The Demon” come out to wrestle AJ? What will happen after Sunday when AJ goes back to Smackdown? What is the longterm, or since the next show is the co-branded Survivor Series, what is the short-term booking fallout here? WWE could surprise fans and have Finn win with assistance from Bullet Club alumni Gallows and Anderson and we see the official formation of the Balor Club. While not an original idea, it would at least make a little bit of sense given the history of the four wrestlers. In reality, once Bray Wyatt was pulled off the show, Finn Balor should also have been pulled and a replacement match of Elias vs. Matt Hardy should have been added to the show. In an even bigger head-scratcher, RAW General Manager Kurt Angle is in a match where he has no major issue, other than general annoyance, with anyone on the opposing team. General Managers wrestling isn’t anything new. Especially since most General Managers have been former wrestlers. However, their matches usually are the culmination of weeks of building verbal and physical altercations. Two weeks prior to TLC at Hell In A Cell, Smackdown Commissioner Shane McMahon fought Kevin Owens after Owens had insulted Shane and physically assaulted Shane’s dad, WWE Owner Vince McMahon. Kurt Angle, on the other hand, has not had any major altercation with The Miz, the Bar (Sheamus and Cessaro), Braun Strowman or “The Original Demon” Kane. So why is Angle in the match? Also, since this is Angle’s first WWE match in a decade wouldn’t they want to have more than 48 hours to promote his return? I’m predicting something happens to Angle during the show and he is replaced by his “son” Jason Jordan in the match. Promote Angle to garner interest, insert Jordan to save Angle’s return for a bigger occasion. Surprisingly, Kurt Angle’s return isn’t the most illogical aspect of this match. The main event of the TLC show is a Tables, Ladders and Chairs match that unlike every other TLC match has nothing hanging above the ring the competitors have to use a ladder to retrieve. It’s also a 5 on 3 match where all wrestlers fight at the same time negating any needs for tags. A 5 on 3 non-tagging, non-ladder tag team ladder match. It’s almost like having a falls count anywhere cage match…oh, wait. 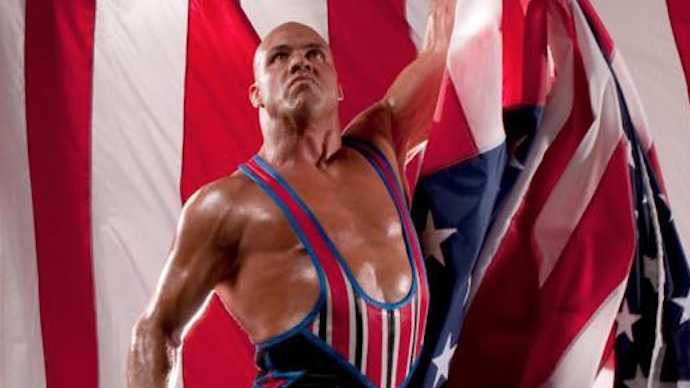 Back to the involvement of Kurt Angle. Since Angle is the Raw GM, how does he show up Monday night on RAW and claim to be an impartial authority figure since he wasn’t forced into a much? If I were The Miz, I would have the WWE board of directors on speed dial and get an answer to this question. While I may not think the storytelling of these two matches makes sense, the matches along with the rest of the show do look good on paper. I will be watching and will be curious to see where WWE goes next. Don’t forget, a new episode of My 1-2-3 Cents the podcast drops every Monday. And new episodes of Positive Cyncism drop usually on Tuesdays when I can find someone to talk to me for an hour.